Frank Luntz, a pollster, political pundit and frequent TV news guest especially during election season, will be the featured speaker at the Tampa Jewish Federations 15th Annual Presidents Dinner on Sunday, Feb. 25. The Federations signature event, the dinner will be held at the Bryan Glazer Family Jewish Community Center. In announcing this years speaker, event co-chairs Carol Jaffe and David Rosenbach called Luntz a candid and engaging voice with insight and perspective who will offer actionable and empowering solutions to combat anti-Semitism and Boycott/Divestment/Sanctions movement. With the rise of Anti-semitism and an active BDS movement on college campuses, this topic and this speaker could not be more current or relevant to our community and around the world, said Jaffe. In May 2016, a New York Times article quoted Luntz as telling a World Jewish Congress PRESORTED STANDARD U.S. POSTAGE PAIDThe Jewish Press Group of Tampa Bay, Inc.The Jewish Press Group of Tampa Bay, Inc. Jewish Press of Pinellas County P. O. Box 6970 Clearwater, FL 33758-6970 VOL. 30, NO. 7 TAMPA, FLORIDA OCTOBER 20 NOVEMBER 2, 2017 16 PAGES www.jewishpresstampa.com Just a nosh.. Just a nosh..Complied from JTA news serviceAfter a year-long national search lel Academy has hired Allison B. Oakes, a 20-year educator in both Jewish day schools and the public school system. 30. Most recently, she served as the head of the Sandra E. Lerner Jewish Community Day School in Durham, NC, where she cultivated faculty and developed partnerships with parents and community leaders. One of her most rewarding achievements there was creating an environment in which learning and caring go hand-in-hand. I am so impressed with the thoughtfulness and dedication said. The many members of the already met have shared with me their hopes and dreams for their lel Academy. She said she also looks forward Hillel Academy chooses new head of schoolBy RON KAMPEAS JTA news service Trump has said what he wants Congress to do with the Iran nuclear deal, which he has called the worst in the world: Make it betwants, what might happen and where the Jewish organizations, many who were on the issue.What Trump wantsThe 2015 deal negotiated by the Obama administration, the European Union, Britain, Germany, France, Russia and China with Iran traded sanctions relief for a rollback of Irans nuclear program. Trump can leave the deal whenever he wants: All he has to do is stop waiving that is, restore the sanctions removed by the deal. Top security advisers have talked Trump out of that option, saying it could damage the U.S. reputation. Instead, they have counseled him to decertify Iranian compliance with the agreement under a 2015 law passed by Congress as a means of overseeing the deal: the Iran Nuclear Agreement Review Act, or INARA. Now that Trump has done that in a White has 60 days to reimpose sanctions. gress to reimpose the sanctions. 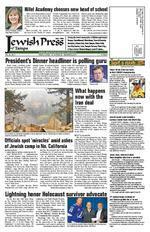 Rather the president wants new legislation, through an amended INARA or through a new law, that would effectively reshape the deal.What happens now with the Iran deal By ROB GLOSTER J. Jewish News of Northern California via JTA of a Jewish summer camp destroyed by a amid the devastation. Although most of Camp Newmans buildings were lost in the North Bay Area gate, prayer books and tallit survived the David that overlooks the Union for Reform Judaism camp from a rocky perch. Each summer, about 1,400 children attend Camp Newman, located on 480 acres east of Santa Rosa. on Friday, Oct. 13, and were shocked by the scene even before they arrived. In an interview afterward, Arquilevich said the road to the camp had featured ways been a neighborhood with a couple of hundred homes But as we drove through that neighborhood, all we saw were homes burned to the ground. This used to be a color scene, and it was black and white. It just haunted me. Arquilevichs spirits were raised, however, when he saw that the giant gate to the camp, inscribed with the words May you be blessed as you go on your way, was standing. Grapes dangled from some vines Ofcials spot miracles amid ashes of Jewish camp in No. CaliforniaSurrounded by blackened vegetation, Camp Newmans iconic hillside Star of David survived a Allison B. Oakes, Hillels new head of school. LIGHTNING continued on PAGE 5 IRAN DEAL continued on PAGE 15 MIRACLES continued on PAGE 15 Lightning honor Holocaust survivor advocateer, the woman who would become his wife of 61 years, Carl Glassberg learned that Irene had evaded death at the hands of Nazis twice, and from the day he heard her story, he committed caust survivors survivors, Glassberg was honored as Monday, Oct. 9, at the Tampa Bay directed his $50,000 award from the Lightning and Vinik Family Foundation to the Gulf Coast Jewish FamSurvivor Program, which serves the whole Tampa Bay area. Since 2011, the Lightning have given more than $13.75 million to more than 300 different charities through Glassberg, who was the 273rd hero, said he was overwhelmed by the generosity of the Lightning organization and enjoyed getting his (L-R) Lightning captain Steven Stamkos, Community hero Carl Glassberg and team owner Jeff Vinik. HILLEL continued on PAGE 7 DINNER continued on PAGE 8Presidents Dinner headliner is polling guru Frank Luntz Israeli driver Alon Day races to rst NASCAR championship ings in the auto racing groups European series, which ended Oct. 15 with a race in Belgium. The Israeli was fourth in the race he needed only to complete the title after being well ahead in The Times of Israel reported. professional race car driver, third in the European series standings the past two seasons. Day, 25, who grew up in Ashdod, began competing training on computer-screen simulators because Israel Jewish coach leads Colombia national soccer team into World CupBUENOS AIRES, Argentina Led by its Jewish soccer team will play in the 2018 World Cup in Russia. countryside, one of the main centers of Jewish immigration ary 2012 and led the nations return to the World Cup in 2014 following a 16-year absence from the world squad to a record of 38 wins, 17 losses and 15 ties. ticipating in the FIFA World Cup for the second year in a row, albeit from the bench.Israeli man, receives kidney from daughter who died in accidentJERUSALEM A 66-year-old Israeli man received a Moshe Shimnoni came out of surgery on Tuesday, Oct. 17, as his daughter, Orit Gur, 44, was being buried Yediot Acharonot reported. liver were transplanted into other patients. Gur had signed an organ donor card several years ago, according to reports. We promised each other a few years ago that if something happened to one of us, wed donate our organs, her husband, Lior, said in his eulogy, The Times of Israel reported. Orit, you did exactly as youd wanted, giving life to other people. The couple have two children, aged 20 and 16. Alon DayNY woman keeps evidence of anti-Semitic gratti for all to seeA Staten Island Jewish woman says she wont be spray-painted on her garage. I just want people to see it, Debra Calabrese told the Staten Island Advance. The people driving by cant believe it. Nobody can. The vandalism also includes the misspelled slur Calabrese, who has lived in the house for 14 years, told the Advance that she was devastated by the atShe said police detectives collected evidence on and then told her she could paint over the anti-Semitic messages. JEWISH PRESS of TAMPA PAGE 3 OCTOBER 20 NOVEMBER 2, 2017 RALPH BOBOArea/Branch ManagerNMLS ID 432371 State Lic. L025098 3903 Northdale Boulevard, Tampa, FL 33624C: 813.781.1024 Ralph.bobo@caliberhomeloans.com www.RalphBobo.com Specializing in Bar/Bat Mitzvah Photography 813.731.2737 cliffmcbride.com Cliff McBride ~ Photojournalist Part of a global movement of giving back for the greater good, #GivingTuesday volunteers are needed to help make phone calls to ask for the communitys support for the Tampa Jewish Community Centers and Federation. The theme for this years #GivingTuesday on Nov. 28 is Get Your Tzedakah On with volunteers working out of Bryan Glazer Family JCC, 522 N. Howard Ave., Tampa. Volunteeers can sign up now for available shifts at jewishtampa. com/givingtuesday. Available shifts are 9-11 a.m., 5:30 7:30 p.m. and 6:30 8:30 p.m. Children are welcome to join their parents with plenty of activi ties for all ages planned: decorate a tzedakah box, enjoy story time, participate in a stamp craft or singa-long; act out The Giving Tree by Shel Silverstein. There will be food offered for everyone. About #GivingTuesday #GivingTuesday was created in 2012 by the 92nd Street Y in New York and has become a worldwide event, harnessing the power of social media to transform how people think, talk and participate in the end-of-year giving season. For more information about the #GivingTuesday event at the Glazer JCC, contact Michelle Gallagh er at (813) 739-1687 or michelle. gallagher@jewishtampa.com.Volunteers needed for #GivingTuesday Nov. 28By CNAAN LIPHSHIZ JTA news serviceAfter 70 years of studying the Holocaust, historians still dont know the exact circumstances of the tragic fate that befell two of the best-known victims of the Holocaust era: Anne Frank and Raoul Wallenberg. Frank, the teenager whose jour nal of her days in hiding from the Nazis in Amsterdam has sensitized millions to the suffering of 6 million victims, died in 1945 in Ber gen-Belsen after the Nazis caught her. But nobody knows who, if anyone, betrayed Â her and her family to the Nazis. Meanwhile, W allenberg, the Swedish diplomat who saved countless Hungarian Jews by issuing them visas to Sweden, disappeared without a trace in the 1940s. Subsequent evidence emerged proving the Soviet Union lied when it said he had died in 1947 in one of its prisons. These mysteries separately have caught the eye of two American experts who both believe they can use the power of computation to make progress in the cold cases. On the Frank case is a retired FBI agent, Vince Pankoke, who recently told the Volkskrant daily in the Netherlands that he has assembled a team of more than a dozen forensics and computer experts. They will use their expertise to scan archives with greater efsible using orthodox methods of historical research. And on Wallenbergs trail is a mathematician from Baltimore, Ari Kaplan, whose specialty is to quantify baseball players perfor mances to identify patterns over time, which can then be translated into effective strategies. In both cases, any success will beat the odds. Dutch police have launched two rather thorough investigations to discover whether Frank was betrayed and if so by whom. Neither the probe in 1948 nor one in 1963 was successful. Since then, writers and historians have offered various theories, none of which were proven, including one centered on the sister of a typist working for Otto Frank, Annes father. But Pankoke, 59, says thats not where the case needs to end. There is so much information available these days, from ar chives, old studies, he told the Volkskrant. For individual people it is impossible to overview in its entirety, but with the right software its achievable. That way you can connect the dots through analysis. Analysis is also the name of the game for Kaplan, the baseball fan and math whiz looking into the Wallenberg case. His algorithms helped pinpoint Wallenbergs exact cell in Lubyanka prison, according to Marvin Makinen, a professor of biochemistry at the University of Chicago who says he heard from inmates who saw Wallenberg alive long after the bogus death announcement. Makinen, Kaplan and several others are part out what really happened to Wallenberg. The algorithm helped Kaplan and Makinen put together Â a complex database analysis of the cell occupancy at the prison from 1947 to 1972 based on partial Russian prison records. In the analysis, Kaplan and Makinen show that some rooms in the overpopulated prison had remained empty on paper, at least for more than nine consecutive months at a time. To Makinen, this suggested a prisoner or prisoners had been kept there but were not listed on the registry. He and Kaplan believe Wallenberg was kept in the cell listed as empty. Moscow denied their request for more prison records, Makinen said. Last year, Makinen and Kaplan visited Moscow to presranging from the Soviets wartime to papers dealing with the return in 1999 of Wallenbergs personal items, Tablet reported in an inter view with Kaplan. The research suggests that receiving just a handful of the documents from the Russian state archives would have solved the case or at least shed light, Kaplan told Tablet. He insists that Wallenbergs fate eventually will be revealed. It is just a matter of when, and I want it to happen soon for the closure of his family and those he rescued, Kaplan said. That is what keeps me upbeat. Despite the impasse they have reached, Kaplan and Makinen Pankoke. After all, they know the Russians took Wallenberg, whereas Pankoke may be barking up the wrong tree altogether, according to the Anne Frank House in Amsterdam. Last year that institution, Â which runs the Anne Frank museum at the address where she hid before her capture and murder, published a report suggesting that Anne Frank and her family were never betrayed, but were caught by chance in a German raid aimed at suspected counterfeiters of food stamps. The issue is controversial in the Netherlands. For decades, the absence of a traitor in Anne Franks story has helped it become a tale A passport photograph of Raoul Wallenberg taken in Budapest, Hungary, June 1944. Can cyber technology solve the Anne Frank, Raoul Wallenberg mysteries? Researchers want to know who, if anyone, betrayed Anne Frank and her family to the Nazis. celebrating the heroism of resistance activists who helped the family hide from the Nazis. But the discovery of a traitor could change the story dramatically, giving a face and a name to the massive collaboration that went on in the Netherlands during the Nazi occupation a key reason for the murder of 75 percent of Dutch Jewry, which is the highest per capita death rate in occupied Western Europe. Thijs Bayens and Pieter Van and journalist from the Nether lands, recruited Pankoke and initiated his investigation. (Last month they published in the media and online an appeal for information from anyone with knowledge of Anne Franks arrest). They are working with Xomnia, an Amsterdam-based company specializing in processing and analyzing large amounts of information, to bring closure to her story, they said. The group, which has more than a dozen investigators, is documenting its efforts on a website called Â coldcasediary.com. The amount of data is over whelming, Bayens told The Guardian. It is at least 20 to 25 and we have just started. To try and make all this data relevant is quite complex, so we started to gorithms to rule the data, as they say. Bayens said that most of the people who were around the Frank family and were still alive after the previous investigations. They were brought in for questioning, he said, so we have detailed reports on that. JEWISH PRESS of TAMPA OCTOBER 20 NOVEMBER 2, 2017 Congregationsous forms of attacks they are meant to protect against. Time will be provided for audience questions. RSVPs are acquired by Friday The cost is $10 per person and guests are welcome. This event is free to members of Kol Ami Sisterhood re-enrollment event: Sisterhood members and those who want to re-enroll are invited to a safari event on Sunday, Oct. 29 from 2-4 p.m. Participants are asked to wear their favorite animal print clothing. There will be a wine bar, hors doeuvres and desserts. With paid dues, Sister hood members are free. The cost for guests is $18. As a tzedakah project, participants are asked to bring non-perishables to be donated to the Tampa Jewish Family Services food panLearn about Israel: A Tree of Life Long Learning series of eight classes on Israel: Yesterday, Today and Tomorrow will be presented by Ephraim Graff. Participants can attend any class as they are on separate topics all related to Israel. Nov. 1, on the history of modern Israel and the second class, on Wednesday, Nov. 8 is on the demographics of Israel and its challenges and opportunities. Additional classes will be held on Jan. 1, 9, 16, 23 and 30 and on Feb. 6 and 13. Classes are from 7:30 9 p.m. New members, vets honored: Shabbat services to welcome new members and honor veterans will be held on Friday, Nov. 10 at 6:30 p.m., with a dinner to follow. The cost for the dinner is $18 for adults, $11 for children ages 4-12 and free for children 3 and younger. Contact the Kol Ami RSVP for the dinner. Brotherhood Pub Night: Thursday, Nov. 16 at 7 p.m. at 1102 N. Dale Mabry Hwy., Tampa. There will be happy hour and erhood will provide appetizers. Drinks, alcoholic or nonalcoholic, are on you. Space is limited. RSVP LChaim: A class, Sharing Lifes Lessons, is offered on Tuesdays from 11 a.m. to noon. Topics, readings and a different leader are chosen for each weekly session. Knitting time: The Sisterhood Needle Workers hold weekly knitting sessions on Tuesdays from 1:30 3 p.m. in the boardroom. For more information, call the synagogue. The knitters make fabric quilt wall hangings and knitting and crocheting squares to make quilts. These are then donated to a group that provides housing for local teens aging out of foster care, as well as other worthy charities. The Needle Workers will meet for a special Sunday session on Nov. 12 from 10 a.m. to noon. For more Cong. Beth Israel Sisterhood lunch and movie: On Tuesday, Nov. 14 hood will hold its annual paid-up members luncheon. All Sisterhood members who have paid their dues are invited to attend at no cost for lunch and a movie. Reservations must be made by Sunday, Nov. 5. For more information about this contact Rochelle Lafer at sisterCong. Bais Menacham ChabadPractical kabbalah: Enrich the soul and mind with a touch of kabbalah. Learn practical spirituality for everyday life. Classes are held on Wednesdays, 6:15 7 p.m.Cong. Beth Shalom BrandonMitzvah Day: Congregants will be performing many mitzvahs on Sunday, Nov. 5, starting at a local nursing home at 9 a.m. and visiting other community locations as well. All are invited to join in. Contact the synagogue for more information. Anton Legal Group Stock Broker DisputesS. David Anton, Esq. Since 1985 Visit us on both sides of the Bay Shipping and Gift Wrapping Available South Tampa St. Petersburg 4004 S. MacDill Avenue Tampa, FL 33611 813.831.2111 Fused Glass Shabbat Candlesticks Hamsa Necklace 300 Beach Drive NE St. Petersburg, FL 33701 727.894.2111 www.shapirogallery.com You can also shop online! There is no song we cant play!Klezmer, Israeli, Top 40, Salsa, Jazz, Swing and more. We also DJ, juggle, do magic, other shtick Have Instruments Will TravelLiven up your Bar or Bat Mitzvah, or Other Simcha www.ChaiNotes.com (646) 303-3125 LIGHTNING receiving a Lightning jersey even though it was too big. A retired accounting executive, Glassberg will be honored again as Gulf Coast Jewish Family & Community Services Community Volunteer of the year on Thursday, Nov. 9 at Faces, the social service agencys annual fundraiser gala. His generosity and his oversight of the agencys Holocaust Survivor Program will be recognized alongside others who have overcome hardships with the help of Gulf Coast programs. Glassberg was born in 1930 and grew up in Manchester, NH. His grandparents owned a furniture manufacturing business where his father worked as sales manager. Glassberg studied mathematics and economics at Dartmouth and continued with graduate studies in accounting at the Tuck School of to a partnership at Peat, Marwick and headquartered in New York. He served the tax division of the American Institute helping those who survived the Holowhen they met in 1952 and he heard her life story: land, in 1930. At the age of 9, Irene and her mother were transported to Auschwitz by train. A faulty mechanism in the gas chamber prevented the Nazis from executing Irene, her mother and 1,000 other women. Instead, they were forced into slave labor. In 1945, Irene was sent to the Mauthausen death camp in Austria. Once again, Nazi plans to exterminate the prisoners were foiled when Gen. George Patton liberated the camp on the last day of the war. She somehow managed to be a social tennis, shed do things. She was not a typical survivor. She would speak to other sur vivors and always wanted to help them. The Glassfound out about Gulf Coasts program 20 years ago when Irene expressed an interest in meeting other survivors. Those who have surance by spending time with others who went through similar experiences. Interaction among survivors enhances their quality of life and provides the emotional strength necessary to stay positive. Irene joined one of the Chavurah groups and Carl quickly was tapped to serve on Gulf Coasts Holocaust Survivor Program Advisory Committee. In addition to socialization, the Holocaust Survivor Program offers assistance with victim restitution, homecare so survivors can remain in their own homes as long as possible, and emergency funds for low-income clients to help cover costs of medicine, food, transportation and other essential services. Upon Irenes passing three years ago, the United States Holocaust Museum in Washington, D.C. honored her contributions to survivors over the years. For his part, Carl remains a member of Holocaust Survivor Program Advisory Committee among his many volunteer efforts through the years to make life better for Holocaust survivors, whether helping them with their income tax calculations or volunteering at the Florida Holocaust Museum. He recently assisted in raising funds that helped meet the needs of 60 Holocaust survivors who live on income considered below poverty level. With this funding, Gulf Coast JFCS could provide hearing aids, glasses, emergency medical and pharmacy expenses, and dental care for the survivors. To Glassberg, the best part of receiving the Lightning Hero award was bringing more awareness to the fact a lot of support. He never misses an opportunity to point out the need for funds. As Holocaust survivors age, their needs grow and expenses increase. Our goal is to make sure survivors live out their lives in peace and with dignity. Never again should they worry about their next meal. Jewish Family & Comunity Services ness, motivates us with his enthusiasm, and holds us accountable with his high standards. The Faces gala will be held at the Hilton St. Petersburg Carillon Park, on Nov. 9, beginning at 6 p.m. with a welcome reception followed by dinner and the program honoring Glassberg and three For more information and to RSVP, go to www.gcjfcs.org/faces2017. JEWISH PRESS of TAMPA PAGE 7 OCTOBER 20 NOVEMBER 2, 2017 5 time winner of The BEST OF NORTH T AMPA JohnErbs.comFREE SECOND OPINION Serving Tampa since 1971with any authorized estimate from a Do not waste your money John will match it or do better.1 mile north of Bearss Ave./Ehrlich Rd. $20 OFFfor one service in 2017 with this ad Local and one way moves. MJCCA | 5342 Tilly Mill Road, Dunwoody, GA 30338 | 678.812.3844 | /CampBarneyMedintz | campbarney.org Raising children in the age of the internet and smart phones can be a challenge, and many parents struggle to understand the effects of this technology and how to set limgeneration to be raised since the invention felt everywhere. To better understand the issues involved, and older and their parents to a free showScreenagers: Growing Up in the Digital Age on Tuesday, Nov. 14. Light refreshments will be offered at 6 p.m. at the school, 2020 W. Fletcher Ave., Tampa. The movie will be shown next door at Congregation Beth Am at 6:30 p.m. The evening will also include a discussion session, with parents and youths invited to participate. This event was originally scheduled for Sept. 12, but was postponed due to Hurricane Irma. Hillel sixth grader David Caine is a typical technological teen, able to juggle more than one tech device at a time. Hillel to present lm, discussion on raising children in digital age Reservations are required by registering by-hillel-academy-of-tampa-3801. For more information, call Cosmo Kunzelmann at (813) 963-2242. The community is invited to hear Rabbi Leor Sinai, co-executive director of Alexander Muss High School in Israel, speak on how teenagers and their families should prepare to respond to anti-Israel and anti-Semitic rhetoric. All Jewish teens are strongly encouraged to participate in this free, casual, interactive program. The program will be held on Tuesday, Nov.7 at 7 p.m. at Congregation Bnai Israel, 300 58th St. N., St. Petersburg. The event is sponsored by Jewish National Fund. Rabbi Sinai will speak on why it is critical for youths to be educated and grounded with a strong Jewish and pro-Israel background. Originally from New York, Rabbi Sinai made aliyah, moving with his family to Israel in June 2011. He began his tenure as co-executive director at the international Alexander Muss High School two years later. As a young adult, he was involved in New York Citys night life as a club producer and MC (Master of Ceremonies), but in 1995 that all changed while he spent the academic year abroad studying at Haifa University. On his return, he completed his bachelors degree in Jewish Studies at New Yorks Hunter College and continued his education at the Jewish Theological Seminary of America, receiving ordination and a masters in Hebrew Letters in 2009. Israeli educator to speak on anti-Semitic rhetoricRabbi Leor Sinai HILLELONTINUED from FRONT PAGEto working with other local organizations to make Hillel Academy the premier institution of Jewish life and learning in the Tampa Bay region. Oakes, whose three children will attend Hillel Academy, is a graduate of the Akiba Hebrew Academy in Philadelphia and has a masters degree in education from the University of Florida. After extensive consideration, we have elected a very special person with whom to partner in the adventure to prepare our children for a future world that has not yet even been envisioned, said Solomon. Her vision and enthusiasm will enable Hillel Academy to reach new heights in innovative learning and Jewish living, said Sandy Solomon, president of the board of trustees. The board is certain Oakes will be a valuable partner and participant in Tampas Jewish community, as the school continues to pursue excellence on every front. nationwide were considered for the leadership position, with guidance from the top When Oakes joins Hillel Academy, she ing and cultivating bonds with students, faculty, staff, parents, and community leaders. every component of the school to facilitate the development of short-term and longrange plans to promote its journey onward and upward. With about 200 students in transitional kindergarten through eighth grade, Hillel Academy is the only accredited Jewish Day School in the Tampa Bay area. It offers both Judaic and general academic studies. The school is located at 2020 W. Fletcher Ave. in Tampa. For more information, go to www. hillelacademytampa.com or call (813) 9632242. PAGE 10 JEWISH PRESS of TAMPA OCTOBER 20 NOVEMBER 2, 2017 r Blazing fast Internet is available and can be yours with fntbtbt With speeds starting at 60 Mbps $ per mo. for 12 mos when bundled* rfrnt CONTACT Y OUR L OCAL AU THORIZED RETA ILER855-738-9969*Bundle price for TV Select, Internet and Voice is $89.97/mo. for year 1; standard rates apply after year 1. Available Internet speeds may vary by address. WiFi: Equipment, activation and installation fees apply. Services subject to all applicable service terms and conditions, subject to change. Services not available in all areas. Restrictions apply. All Rights Reserved. Charter Communications. $8997ftb f bfSPECTRUM TRIPLE PLAYTMTV, INTERNET AND VOICE who have dedicated their time, talents, and lives to the Jewish community. All honorees will be inducted into the Weinberg Village Jewish Senior Hall of Fame at our 8 Over 80 Awards Reception. ve he te s e cognie 2017onoees 2 pm Bryan Glazer Family JCC522 North Howard Avenue, Tampa, FL 33606Stanley Bush Maril Jacobs Shirley Kanas Barbara Moudy Harold Perlman Jerry Schine Elaine Viders Arthur Viders Proceeds raised through the publication of the Mazel Tov recognition book will be directed to the Weinberg Village Facility Enhancement Fund and the Harry & Jeanette Weinberg Endowment Fund. If you would like to honor the recipients in the Mazel Tov recognition book and/or need additional information, please contact Ben Gersten at 813.969.1818 or ben.gersten@jewishtampa.com.HARRY & JEANETTEWEINBERG VILLAGEOn the Maureen & Douglas Cohn Jewish Community CampusA wholly owned subsidiary of Tampa Jewish Community Centers and Federation, Inc.813.969.1818 | www.WeinbergVillage.com Assisted Living Facility License No. 08679 Community Hanukkah dinner planned for Dec. 17 at Glazer JCCNew to town? New to the Jewish community? The Tampa Jewish Federation will welcome young adult newcomers (ages 20s, 30s and 40s) on Sunday, Nov. 5 from 1:303:30 p.m. at the South Tampa home of Brian and Carlyn Neuman. Area newcomers will meet other young Jewish professionals from the Tampa area, and learn how to get involved with the Tampa Jewish Federations new IMPACT initiative for young adults. IMP ACT is a group of young adults in their 20s through 40s, who share a commitment and passion for tikkun olam (repairing the world) and building a strong Jewish community with the Tampa Jewish Federation. There is no cost to attend this event. To learn more, contact Lisa Robbins, lisa.robbins@jewishtampa. com or call (813)769-4723. RSVPs requested; address will be shared upon RSVP. This event, originally scheduled for September, was rescheduled due to the effects of Hurricane Irma.Nov. 5 is new date for young adult newcomers noshThe community is invited to attend a Hanukkah Dinner Extravaganza on Sunday, Dec. 17 at the Bryan Glazer Family JCC. The evening will include a buffet dinner, tableside entertainment, menorah lighting, dreidel spinning, festive Hanukkah music. Spirits will be available for purchase for adults age 21 and over. Seating for dinner begins at 5:30 p.m. followed by the lighting of the menorah on the sixth night of Hanukkah. Tickets are now available and sales will end on Friday Dec. 15. Cost is $36 per person, ages 12+; $18 for children 5-12; $10 for toddlers 2-4 and children under 2 are free. High chairs are available by request at the time of reservation. Tables can accommodate up to nine guests with community seating for parties less than nine. so be sure to purchase your tickets early by going to www.jewishtampa.com/Hanukkah. (JTA) A city in Texas is requiring applicants for Hurricane Harvey rebuilding funds to certify in writing that they will not take part in a boycott of Israel, spurring criticism from the American Civil Liberties Union. The website for Dickinson, TX is accepting applications for individuals and businesses who need assistance following the August hurricane. According to the a pplication, those who sign must verify that the applicant (1) does not boycott Israel; and (2) will not boycott Israel during the term of this Agreement. Dickinson City Management assistant B ryan Mil ward attributed the clause to a state law, signed in May, that requires all state contractors to certify that they are not participating in boycotts of Israel. Milward emphasized that the city will not be verifying compliance with the clause and said he doesnt expect any applications to be rejected because of it. Because our application also functions as a contract, it was included in there, Milward told JTA. Were not checking up on that. Our city secretary is not digging into anyones background. Were not running background checks or anything like that. Theyre attesting that theyre not boycotting, and were accepting that based on good faith. Dickinson, a city of about 19,000, was hit especially hard by Harvey. More than three-quarters of its homes were damaged by the hurricane, and 830 were destroyed, according to Milward. ACLU calls the Dickinson application a violation of free speech rights. The First Amendment protects Americans right to boycott, and the government cannot condition hurment to refrain from protected political expression, ACLU of Texas Legal Director Andre Segura said in a statement. Dickinsons requirement is an egregious violation of the First Amendment, reminiscent of McCarthy-era loyalty oaths requiring Americans to disavow membership in the Communist party and other forms of subversive activity, he said. Supporters of laws aimed at the Boycott, Divestment and Sanctions movement argue that refusing to do business with a country is not protected speech, and that longstanding laws forbidding support for foreign state boycotts of Israel apply to the business transaction, not the political motivations. If anti-boycott laws are considered unconstitutional, proponents argue, then Americans would be free to violate existing sanctions preventing business with countries like Iran, Cuba or Sudan.Texas town says you cant get hurricane relief if you boycott IsraelBen Kingsley playing Eichmann in lm about capture by Israeli agentsBUENOS AIRES, Argentina (JTA) Academy Award winner Ben Kingsley is in Buenos Aires the capture of Adolf Eichmann by Israeli agents. Kingsley, a British actor, is starring in Operation Finale which chronicles the notorious Nazis life as Ricardo Klement living in the Argentine capital after World War II and the Mossad operation to capture him. A Mossad unit led by Peter Malkin captured Eichmann in May 1960; he was executed in Israel in 1962. Malkin will be played by the Guatemalan-American actor Oscar Isaac. Matthew Orton wrote the screenplay. Tony Award winner Michael Aronov will play another Mossad agent, Zvi Aharoni. Kingsley, who won an Oscar for his 1982 portrayal of Mahatma Gandhi, has played Moses for TV (1995); Itzhak Stern in Schindlers List (1993); Otto Frank for Anne Frank (2001); and Simon Wiesenthal in Murderers Among Us (1989). tackle the subject. The Man Who Captured Eichmann, a 1996 based on the book Eichman In My Hands, written by the Mossads Malkin with Harry Stein. Argentina was a haven for Nazi war criminals after World War II, including Eichman, Joseph Mengele and Erich Priebke. One month ago the country presented to Israel tens of thousands of documents from the World War II era, some of them related to Nazi war criminals. JEWISH PRESS of TAMPA PAGE 11 OCTOBER 20 NOVEMBER 2, 2017 15 th Frank Luntz, PhD A candid, engaging and powerful voice that provides insight and perspective Emmy Award winner, three-time best-selling author and one of the most honored communication professionals in America Featured on 60 Minutes, Good Morning America, Frontline, The PBS Newshour, Face the Nation, Meet the Press, The Colbert Report and The Today ShowWords That WorkCombatting Anti-Semitism and Boycott, Divestment and SanctionsSunday, February 25, 2018 Bryan Glazer Family JCC PRESENTING SPONSORPRESIDENTS CIRCLELynne & Fred Merriam Sharp Business SystemsPRESIDENTS FRIENDSTampa General HospitalPRESIDENTS CABINET Tickets$180Patron Tickets$300includes program recognition and a charitable gift made in your honorBuy Online Now!www.JewishTampa.com/APDFor information or to inquire about sponsorship opportunities Michelle Gallagher Director of Philanthropic Engagment michelle.gallagher@jewishtampa.com 813.739.1687 Sponsors as of 10/10/17By PENNY SCHWARTZ JTA news serviceBOSTON If New England Patriots star Julian Edelman retires from the NFL anytime soon, he clearly has a promising second career as a Jewish childrens book writer. In front of about 400 children and their families at the Newish Community Center of Greater Boston, the 31-year-old wide receiver and Super Bowl hero read a special edition of a childrens book he co-wrote last year. Unsurprisingly Edelman, who has Jewish ancestry on his fathers in recent years, was treated like a rock star. Hes a really good receiver and I hope I like his book, Ilan Sherman Kadish, one of Edelmans many young fans in attendance, said before the player spoke. The event was organized by PJ Library, the Massachusetts-based global Jewish childrens book giveaway program supported by the Harold Grinspoon Foundation in partnership with other philanthropists and local Jewish community organizations. Edelmans book, Flying High, a semi-autobiographical story about an endearing squirrel named Jules who is determined to play football, were mailed this month to 5-yearolds in Jewish homes across North America through the PJ Library program. Before Edelman read his book, the audience was shown a video with footage from his visit to Israel in 2015 (which was cosponsored by the Combined Jewish Philanthropies of Greater Boston). The crowd cheered loudly after the video as Edelman, wearing a brace from a preseason knee injury that has kept him from playing this season, made his way onto the stage. Edelman said onstage that the story of Israel reminded him of his own struggles to push past those who overlooked him. He nal round of the 2009 draft by the Patriots and was not projected to succeed in the league. But he has notched over 400 career receptions, helped the team win two Super Bowls and become quarterback Tom Bradys favorite target. I fell in love with the people of Israel, Edelman said, noting his admiration for how the small country thrives despite being surrounded by unfriendly countries. Its a theme he said he wanted to convey in a childrens book, especially after the birth of his daughter, Lily, last November, to whom he dedicated the book. The new PJ Library edition of Flying High includes extra mathat emphasizes the storys Jewish content and values. There is also a new reference to Theodor Herzl, the founder of modern Zionism. Julian Edelmans childrens book gets a Jewish makeover photo by Etan Harmelech/Harold Grinspoon FoundationOne lucky fan had a fun encounter with Julian Edelman at a private reading of his book at the JCC of Greater Boston before the main event, Oct. 10, 2017.The dedication page includes one of Herzls most famous quotes: If you will it, it is no dream. The quote shows up in illustrations throughout the story as its young squirrel protagonist trains hard and perseveres against his detractors a group of animals that includes an eagle, a buffalo and a bear who ridicule him for being too weak, slow and small. The idea for the quote came from the Israeli-born Assaf Swissa, Edelmans coauthor. Edelman told JTA after the event that while the quote was not central to the of the Herzl quote. A second Flying High book is due out in time for Hanukkah, Swissa told JTA. Edelman has become an object of Jewhimself as a member of the tribe in a 2013 interview on the NFL Network. He has tweeted about Jewish holidays, wore an Israel pin during a game in 2014 and was named one of the best Jewish football players of all time by the American Jewish Historical Society last year. PJ Librarys founder, Jewish businessman Harold Grinspoon, and his wife, Diane Troderman, both philanthropists, attended the event with Edelman along with their grandchildren and other members of their family. Edelman is an amazing guy. Hes a heimische guy. Hes so real, Grinspoon told JTA, using a Yiddish term meaning friendly and down to earth. I love the [Flying High] story because its so true to who he is.